Madeline is a managing partner of the firm. Her practice is concentrated in the areas of creditors’ rights, commercial loan workouts, commercial lending, commercial real estate and complex commercial litigation. Madeline has a multistate commercial loan workout and commercial litigation practice. She has 25 years of experience representing banks in commercial loan restructurings and large-scale collections. Madeline’s diverse litigation experience includes commercial real estate, telecommunications and other contract disputes, the pursuit of prejudgment remedies (including replevins, receiverships and attachments), the defense of lender liability actions, and the representation of secured and unsecured creditors, debtors and other parties in State and Federal (U.S. District and Bankruptcy Courts) in New York and elsewhere. Madeline routinely represents lenders and borrowers in commercial real estate and other asset-based financing transactions. Madeline also has substantial experience serving as outside counsel to an international manufacturer of engineered glass systems, boat covers and tops, and molded vinyl and other aftermarket supplies, for the global industrial, recreational marine and power sports industries. In this role, she has negotiated and drafted a multitude of supplier, distribution, license and royalty agreements, as well as non-disclosure agreements and non-compete agreements. 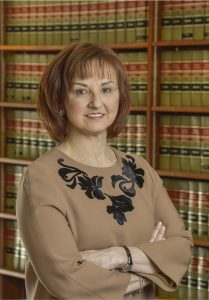 Madeline holds an AV rating from the Martindale-Hubbell Directory of Attorneys, and has since 2012 been recognized in Super Lawyers – Upstate Edition. Counsel to a secured lender in the negotiation and documentation of commercial loan workouts totaling in the aggregate more than $80,000,000.00, involving residential (condominium) construction projects in New York State. Counsel to a secured lender in commercial loan workouts and litigation involving jet aircraft loan and lease transactions. Counsel to a Bank Group in the negotiation and documentation of a $68,000,000 loan workout respecting a mixed-use project consisting of more than 326 apartments, 190,000 square feet of retail space and hotel pad sites in New Jersey. Counsel to a secured lender in the negotiation and documentation of multiple loan workouts totaling involving numerous regional shopping centers and shopping malls located throughout New York. Counsel to a secured lender in the negotiation and documentation of multiple loan workouts totaling in the aggregate more than $100,000,000, involving five assisted living facilities in Connecticut, and four nursing homes and an assisted living facility in Massachusetts. Counsel to a secured lender in the negotiation and documentation of an IRC 1031 exchange and a $55,000,000 loan workout respecting seven assisted living facilities located throughout New York State and Connecticut.